Exiles was a Marvel release which ran for at least 100 issues, yet in many ways had little impact on the less of the Marvel universe. Essentially it was a combination of the old Marvel What If? stories and the Excalibur v.1 story, the Cross-Time Caper. The Exiles are grouped by an entity called the Timebroker (or so they are told) and are comprised of various characters both new and old, often from various Earths. There is not always much to do with Earth-616 (the regular Marvel universe), but this can be a good thing. Too often comics from DC & Marvel try to put their particular character or team at the center of everything which is going on; this can get tiresome. Exiles started a few years back so most of it is free from the non-stop tie-ins like House of M, Civil War, Annihilation Saga, and Secret Invasion in just the past few years. There are probably two or three “main” characters; it’s hard to really say as the team members shift constantly. There’s even a second group of Exiles, made up initially of Weapon-X guys and mostly “villains,” including a sadistic Spider-Man, She Hulk, Deadpool, etc. In my opinion the earlier parts of this series are better than the latter, when Chris Claremont took over. It should be noted I generally dislike Claremont, however. A big part of enjoying exiles is accepting the humour and the fact that much of the series is in fact absurd. I rolled my eyes when they ended up going to Mojoverse, but they never took it seriously and called the story arc, “So Lame,” which is usually accurate with anything Mojo-related. Those who watched the X-Men animated series can attest to this, or read any of the Dazzler/Longshot comics. A lot of the humor comes from Morph, the shapeshifter; it’s generally juvenile and that might be a drawback for some, but there’s a great issue where he explains to Sunfire the source of his immaturity. The Sunfire in question is not Shiro Yashida, but rather Mariko, a.k.a. Wolverine’s girlfriend. She isn’t that from her univese, either. Nocturne is another interesting character- Nightcrawler’s son. With Wanda Maximoff. Her powers are pretty strange, and apparently Kurt Wagner makes for a good looking woman. Go figure. However, I feel that Exiles’ biggest strength is what could be perceived as a weakness- its general lack of continuity with other Marvel titles. What it does do is give the writers a chance to explore fringe characters and even some major ones, as well as introduce more. Exiles is generally light-hearted, but it has a surprising and refreshing dark side. Most significantly, people die. A lot of them. And when they die, they stay dead. I’d recommend giving it a read in between other major comics- it’s not something key to understand the Marvel world, but it’s definitely entertaining, something often lacking in recent comics. Give it a shot. 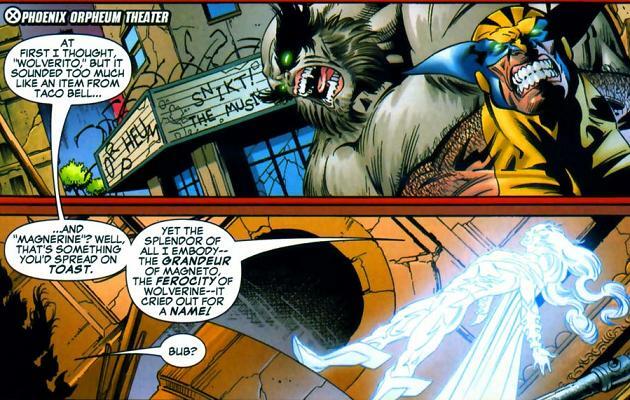 PS: The image is from late in the series, in a great, absurd arc called “Snikt-o-rama.” The picture made me laugh, so here it is; be glad to know Wolverine cameos are somewhat less frequent in Exiles than in most other series, though he still pops up an awful lot. The Orpheum? That’s right down on State Street! We’re all doomed! They’re here!